Fully Illustrated’s game hit my radar back at the end of the summer when Nintendo revealed it was part of a renewed push to bring indies to the Switch. But the gameplay for Wulverblade was first shown as far back as 2014 when Xbox debuted a trailer for it during E3. A lot of time has gone into what might otherwise seem like a straightforward and potentially derivative game. And ultimately, it shows. 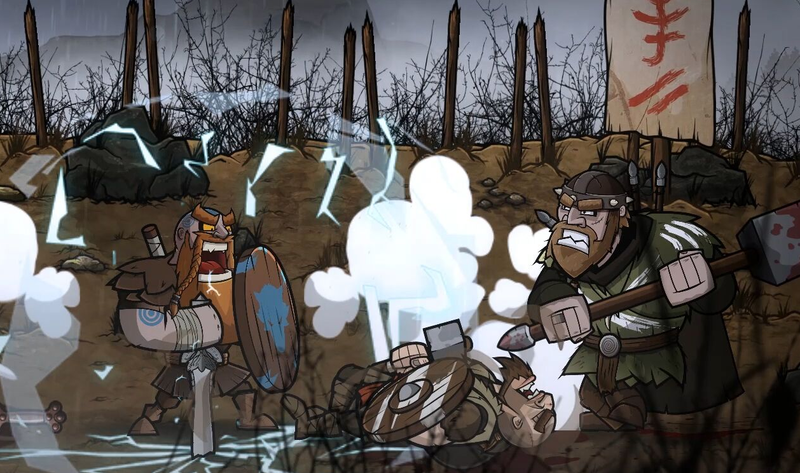 Wulverblade is a side-scrolling brawler about British tribes revolting against the Roman Empire in which you slice enemies and bash their heads in across a series of left-to-right levels. If someone drops a knife you can pick it up and throw it at someone else on the other side of the screen. Stumble upon a long ax, or even a shovel, and you can start smashing oncoming mobs with it. There are three different characters to play as, ranging from weak and dexterous to brawny but slow, and a handful of different combos—jumping slashes, ground stomps, and rolling uppercuts—that are utterly crucial to progressing. Button mashing might feel instinctive, in other words, like when you were planted in front of the X-Men arcade game flailing fruitlessly at an overpowered boss, but it will not get you very far. In the ten hours I’ve spent so far with the Wulverblade, I’ve only managed to get a few levels in. In part this is because the game looks gorgeous and handles so effectively it’s easy to get stuck in the same futile loop and still feel satisfied. The game likes to slow down when you deliver the death blow to the last enemy currently on the screen, and the fluid animations of bodies dismembering and their severed parts gliding effortlessly across the stage help you to feel like you’re progressing even when you’re slowly losing ground. I can’t count the number of times I made it to a boss ready to throw down only to realize I had no lives left and would momentarily get torn to shreds. In this regard, the game’s heightened violence is not just for cheap thrills. The battlefield is a gory place and you have no choice but to diligently manage every advantage at your disposal in order to make sure as little of the red stuff spilling out across it comes from you. That means building up a rage meter and employing it when there are plenty of enemies to chop away at and enough still enough time to build it back up for whatever boss is waiting at the end of the level. It also means not being afraid to unleash your hounds, a once per stage ability where wolves run on screen and maim your attackers,rather than save it until the battle’s already lost. But most of all, overcoming Wulverblade’s challenges requires weaving together blocks, dodges, knock backs and hit streaks into an elegant ballet wherein getting out of the way of incoming attacks is just as important as whaling on the hoards continuing to throw themselves at you. Fully Illustrated is actually introducing a patch to add an easy mode and checkpoints before bosses to make Wulverblade more approachable, but personally I think it’s fine as is. If progress really grinds to a halt, you can always find a second person to play with taking advantage of the Switch’s built-in co-op functionality via the two Joy-Con. There’s another side to the game, however. Detailed backgrounds include a number of different layers of animation that combine to create rich landscapes that shift from forests and villages to mountain tops and Roman encampments. For a retro-brawler inspired by the 8-bit and 16-bit eras, Wulverblade’s levels feel remarkably alive and defined. A note early on in the game from the developer explains that a lot of time was spent researching Rome’s occupation of the island. At different checkpoints there are rune stones that relay fragments of these histories which help to move the story beyond the cartoonish vendettas that plague most games in the genre. That’s not to say that Wulverblade is rife with political intrigue or philosophical reflection. It remains a game primarily focused on teaching the player the most economical way to hack’n slash through three or more enemies at once. But while it’s trying to teach you to be ruthless and merciless (plunge your sword into an enemy while their down and you collect bonus charge for your meter), it’s also charting, with an amount of cinematic artistry unusual for a side-scrolling beat’em up, a tale of rebellion and loss that resonates beyond its comically proportioned characters and finger twitching. I want to keep returning to Wulverblade to prove I can adapt to and overcome it’s punishing combat, but also because I feel compelled to help its heroes defeat their Roman invaders. The game is currently available on the Switch but will be headed to PS4, Xbox One, and PC in the future.